Designed to fit DJI Spark. Reinforced exterior offers water-proofing and impact resistance. 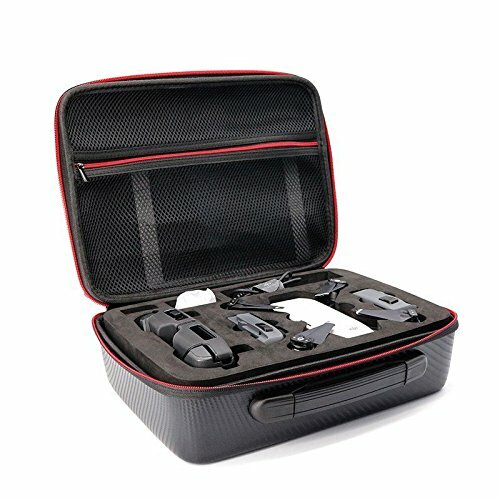 Pre-cut foam inserts with fully padded compartments for the drone, transmitter, charger, batteries and other accessories. Color: Black with red trim. Material: PU leather exterior and EAV foam interior. Designed to fit DJI Spark with DJI transmitter controller. Reinforced PU leather exterior offers basic water-proofing and good impact resistance. When first opened the case has noticeable "new case" odor. The smell will dissipate in 3-5 days after opening. The best way to help the smell dissipate is to keep the case open. View More In Bags & Cases. If you have any questions about this product by HUL, contact us by completing and submitting the form below. If you are looking for a specif part number, please include it with your message.